Nicholas O’Leary is the All Ireland Sailing Champion for the second year in a row and his dad Anthony is again in second place. 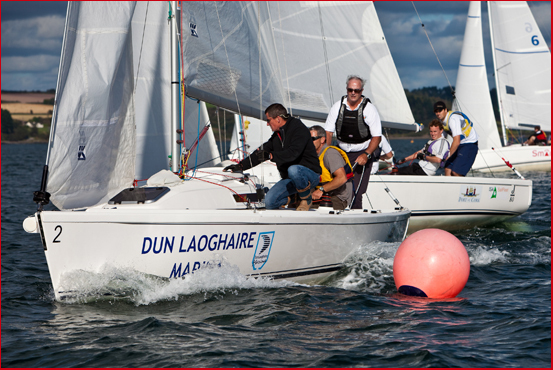 The ISA All Ireland Sailing Championship took place at the Royal Cork Yacht Club this weekend (25th – 27th Sept in very light winds however that didn’t prevent the race committee from completing the regatta. 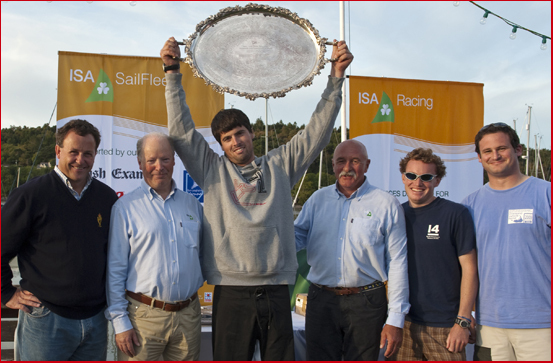 The 2009 ISA All Ireland Sailing Champion is Nicholas O’Leary, from the Royal Cork Yacht Club for the second year running. In 2008 he was also the recipient of the First Timer GP14 Award and previous to that he won the Student Yachting World Championship, when representing Cork Institute of Technology in La Rochelle, France. His father, Anthony O’Leary was second overall, which incidentally was the same result for both of them at the 2008 Championship. Both O’Leary’s are members of the Royal Cork Yacht Club and provided a battle royal between the pair throughout the weekend. Close encounter of a different kind. Anthony O’Leary with crew Maurice (Prof) O’Connell and Tom Durcan, leads his son Nicholas (defending Champion) with crew Adam McCarthy and Marty O’Leary at the weather mark in Race 2 of Flight one of the ISA All Ireland Sailing Championship at Crosshaven yesterday. Photo Robert Bateman.